After spending a whole day installing a fresh copy of Mac OS X v10.8 (Mountain Lion), Xcode 5, fixing provisioning profiles, certificates, creating new ones, I finally managed to get my applications running on my iPad again. The problem is that in Xcode 5 I don't have a menu item for Library - Provisioning Profiles, and I don't know what could have happened. I restarted the computer, tried some things, but I really have no idea what I could do. How can I fix this problem? No longer supported ... you can also download Apple's iPhone Configuration Utility 3.5 for Mac OS X, it still has "Provisioning Profiles" and works with Xcode 5 -- it's now gone from Apples site but you can find an alternative download link in @suda's comment. Just remove the out-of-date files. Select the Apple ID in the left panel. Click the View Details button on the right. In the pop-over that follows click the round refresh arrow. The lists will refresh after the download from the Member Center finishes. This can take a few minutes. 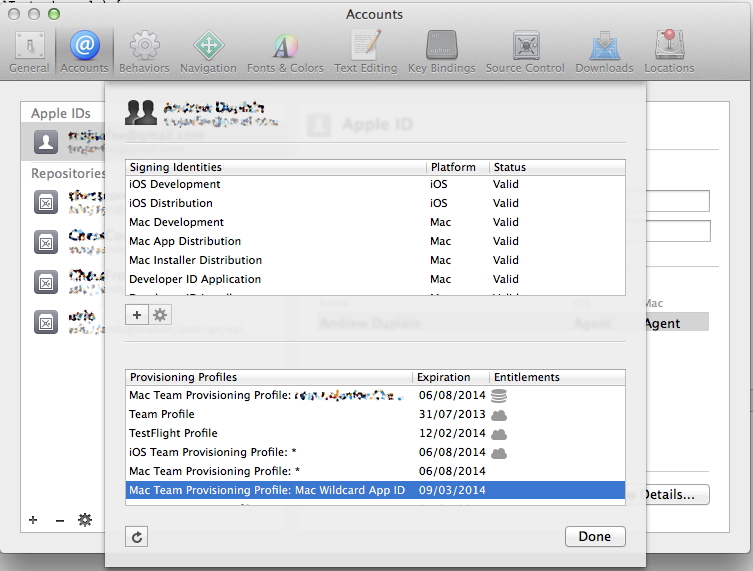 The provisioning profiles can then be selected in a Mac project under Build Settings => Code Signing => Provisioning Profile. You can add account in the preference -> Accounts setting. It seems that you already configure xCode4, then I think you can select your certificates for compiling in project-> Building Setting directly since your certificates are already in your keychain. After searching a few times in google, i found one software for provisioning profiles. Install this iPhone configuration utility software and manage your all provisioning profiles in MAC. 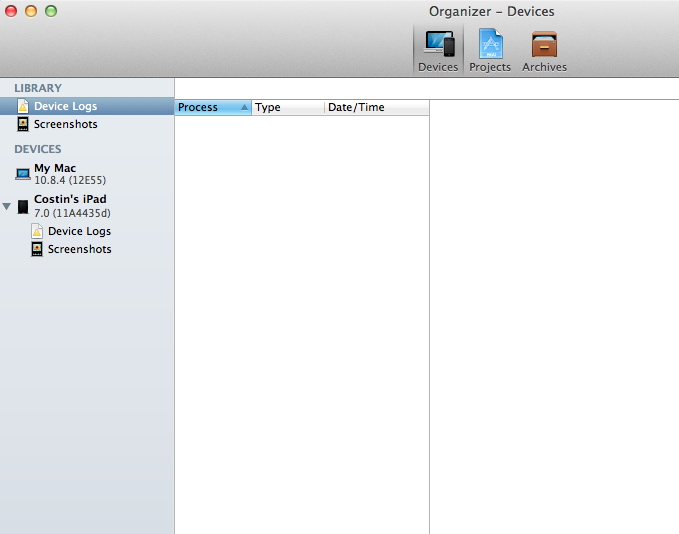 Stupid as it may sound but all "Provisioning Profiles" re-appear under "Organizer - Devices" once you connect a real device. For me, the refresh in xcode 5 prefs->accounts was doing nothing. At one point it showed me three profiles so I thought I was one refresh away, but after the next refresh it went back to just one profile, so I abandoned this method. When I did this, everything synced up perfectly. It even told me what it was downloading each step of the way like good software does. After the sync completed, I closed xcode 4.6.2, re-opened xcode 5 and went to preferences->accounts and voila, all of my profiles are now available in xocde 5.